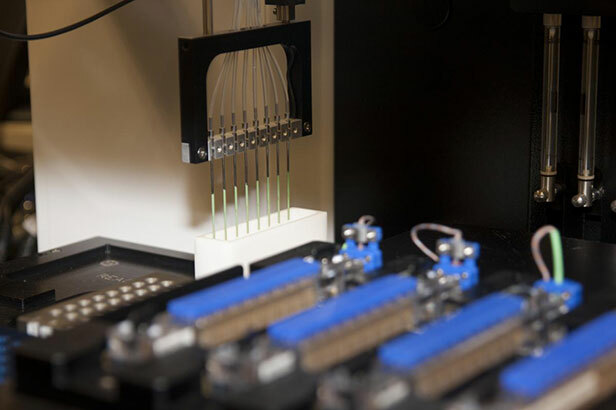 The Ohio State University Plant Microbe Genomics Facility, established in 2000, is a center providing DNA sequencing products and services to researchers conducting molecular-based studies and genetics. The facility serves Ohio State and researchers throughout the world by providing resources to study genomes from DNA sequence to protein activities. The facility can study any organism’s DNA, RNA or protein. PMG is the preferred sequencing facility around the globe because of its ability to access and leverage multidisciplinary expertise from the fields of the arts and sciences, medicine, dentistry, human development and nutrition, consumer sciences, food, agriculture, and environmental sciences and because of its ability to create new uses for equipment that goes beyond technology’s original use. If researchers are conducting molecular-based studies, they rely on PMGF to deliver outstanding computer science expertise. Davlieva, M, et al. 2015. A variable DNA recognition site organization establishes the LiaR-mediated cell envelope stress response of enterococci to daptomycin. Nucl. Acids Res. 43(8): 4758–4773. Joshi, G, et al. 2013. The Regulatory Twist and the Synergistic Role of Metabolic Coinducer and Response Regulator-Mediated cbbRcbb, Interactions in Rhodopeudomonus palustris CGA010. J. Bacteriol. 195(7):1381-1388. Logsdon, M, et al. 2011. Analysis of the DNA Sequencing Quality and Efficiency of the Apollo100 Robotic Microcycler in a Core Facility Setting. J Biomol Tech. 22(2): 53–59. PMGF staff work with undergraduate and graduate students conducting research. PMGF staff provide educational tours and lectures targeted to high school students with an interest in the sciences.